For decades, the hotel industry has taken many ideas from the airline industry such as loyalty programs, separate areas for business travelers and inventory yield software. Now it appears that some hotels are looking to trains, specifically the idea inherent in a Pullman car berth. Why not provide a place to sleep when a fully equipped hotel isn’t necessary? When Osaka, Japan first developed the idea of a capsule hotel in the 1979, the Western Press went on a rampage comparing these sleep modules to everything from human filing cabinets to morgue drawers. 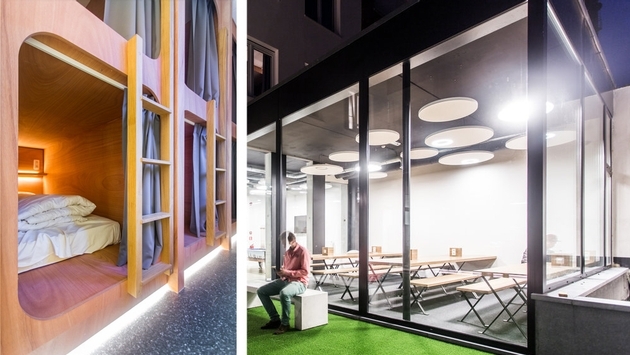 Thirty years later we can hear a last laugh emerging from Japan as the Antwerp Student Hostel (ASH) opened this week as Western Europe’s first capsule hotel with prices from about $31 per night.